French saxophone player, composer and producer QUENTIN PAQUIGNON studied music and ballet dancing in conservatory since the age of 5. 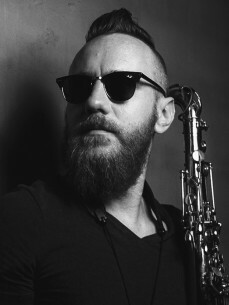 Awarded by several first prizes of classical saxophone and musical chamber contests, QUENTIN PAQUIGNON built his eclectic musical journey by performing with symphonic and military orchestras, caribbean band Jeff Joseph and Gramacks New Generation, Erik Truffaz Quartet, Zhou Bing Qian Orchestra, Coco Zhao before crossing the path of electronic music when QUENTIN PAQUIGNON started to perform at Unïco Shanghai. During 4 years, QUENTIN PAQUIGNON expressed his musicality with international famous djs such as DJ Gilles Peterson, DJ Maestro (Blue Note Records), FKJ (French Kiwi Juice), before meeting his future creative partner BEN HUANG. Together they created BHQP and quickly started to perform in numerous clubs and festivals around China. QUENTIN PAQUIGNON is also the founder of the immersive art collective THE POLYMORPH EXTRA which won several awards in international film festivals around the world with its short animated movie LEONOR’S LULLABY. QUENTIN PAQUIGNON’s first movie was also selected among The Chemical Brothers, or Radiohead music videos at the international music film festival Seeyousound 2017 in Turin (Italy).